SOUTHFIELD, Mich. – On Saturday, Sept. 19, Lawrence Technological University (LTU) will host the national championships to determine who will represent the United States at the World Robot Olympiad (WRO) to be held Nov. 6-8 in Doha, Qatar. The competition will be held at the Don Ridler Field House on LTU’s campus at 21000 West Ten Mile Road in Southfield. The opening ceremony begins at 9 a.m., and the closing ceremony is scheduled to start at 4:40 p.m. The event is open to the public, and admission and parking are free. WRO started in Singapore in 2004, and this is the second year the United States will send a team. Nearly 20,000 elementary, middle and high school students as well as university teams from over 50 countries are participating. Eighty-eight teams competed in state qualifiers here in the United States, and 43 teams have advanced to the national finals from California, Florida, Texas, New York, New Jersey, Illinois, Louisiana, Washington and Michigan. 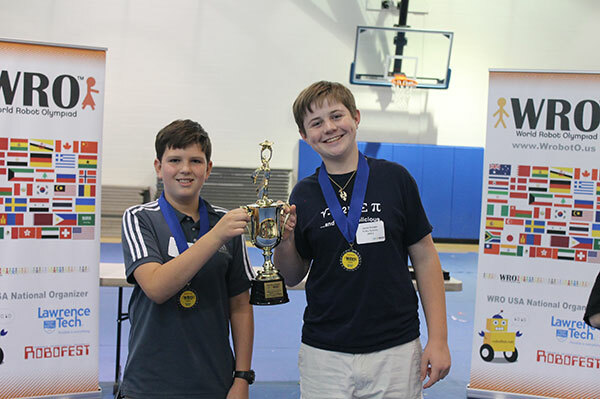 WRO-USA differs from many other robotics competitions because the winners will represent the United States in international competition. “Being selected to represent your country really means something. The American teams will be competing against the best teams from around the world,” said LTU Professor CJ Chung, who is coordinating the national competition for the second time. Last year three students from Canton and Northville won a bronze medal in the WRO competition held in Russia, while a team from LTU finished fifth in the university division. Chung, who teaches computer science, was selected to lead WRO-USA last year because of his leadership role in LTU’s Robofest competition. Like WRO, Robofest makes it fun for students to learn important principles of science, technology, engineering and math, known as the STEM subjects. In this year’s WRO competition, students must build and program a robot that can dive and explore under the sea for pearls, or collect five artifacts in an unknown environment, or collect supplies and deliver them. In the open category the task is to create robots that can help humans explore for natural resources in potentially hazardous environments. WRO General Secretary Claus Ditlev Christensen of Denmark will give opening remarks at LTU and observe the WRO-USA finals.